Packed Full of Brand New Designs, Our 2019 Idea Book is Out Now! 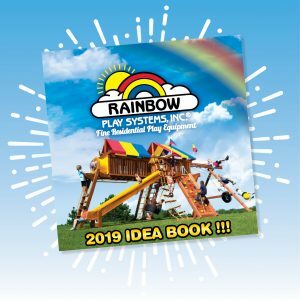 Celebrating 34 years of Building Childhood Memories®, Rainbow Play Systems’ new 2019 Idea Book catalog has just been released! The catalog has been reinvented to make the most out of each of our unique and one of a kind playsets. Every idea is just a sample of what can be imagined in each playset series. Highlighted throughout the 2019 Idea Book catalog, you will see a “NEW IDEA” logo within each series to indicate which units are fresh out of the drawing book. Ideas without the logo should not be overlooked though as those are the tried and true original designs that our customers have come to enjoy throughout the years! 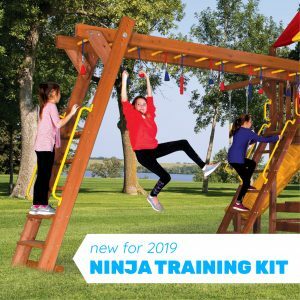 Be sure to check out one of our newest options, the Rainbow Ninja Training Kit! We are bringing back our ever-popular Monster Series and Sunshine Clubhouses this year with even bigger deck heights! Returning this year is our Fiesta, Carnival, Rainbow, and King Kong Series, but with new and more improved ideas. Towards the back of the catalog you will find our 12 Rays of Sunshine, which highlights the 12 Years of Childhood. Also included are our safety standards, the structural designs of both the Castle and Clubhouse Series, and the engineering details of features and materials used to make our swing sets. Your Rainbow Swing Set is a once-in-a-lifetime purchase. With 180 designs, 180 options, and 200 Rainbow Play Showroom Locations, let’s design your family’s dream Rainbow Play System! Visit our 2019 Online Catalog here, or find your nearest showroom to pick up an Idea Book in person today!